Empowering Adolescent Girls in Developing Countries: Gender Justice and Norm Change provides excellent analysis of new research into norm change relating to adolescent girls. Adolescence has long been an area of interest in the development sector, and particularly within gender equality initiatives. It has been identified as a critical stage in human development, during which identities, attitudes, and behaviours solidify. Increasingly, social norms are also being recognised as central to the development agenda. This volume brings together these two complementary areas, exploring how discriminatory gender norms can limit adolescent girls’ development of their capabilities, while also highlighting pathways for realising more egalitarian gender norms. Alongside an introduction, conclusion, and an opening analytical chapter, the volume is organised into four sections focusing on, respectively, Ethiopia, Uganda, Vietnam, and Nepal. Examples of programmes and policies in the four countries are provided throughout, offering a practical insight into strategies for effecting norm change. Nicola Jones, Elizabeth Presler-Marshall, and Fiona Samuels introduce the book by explaining the critical importance of adolescence in a girl’s life course. They provide a useful overview of basic social norms theory, including descriptive norms (perceptions of what people do), injunctive norms (perceptions of what people should do), reference groups (people whose expectations matter) and the vast array of religious, local, and political factors which ‘overdetermine’ social norms (pp. 2–3). Gender norms, which are central to our existence and integrated into our social interactions and understanding of the world from birth, are seen as being particularly ‘sticky’, and resistant to change. This research focuses on the nexus between education and child marriage. In the opening chapter, Caroline Harper and Rachel Marcus build on this introduction to give a comprehensive overview of approaches to social norms in the social and behavioural sciences, and explore how changes in attitude and behaviour occur. They argue that girls’ empowerment and an understanding of power dynamics is critical to all approaches to norm change, and must go beyond the individual to look at the patriarchal nature of social institutions and the ideological sphere if these changes are to be sustainable. The empirical research from the four countries – comprising two chapters each – follows, opening with evidence from the Amhara region of Ethiopia. Here we learn how the recent decline in child and arranged marriages, increased access to divorce and contraception, and improvements in girls’ school attendance belie worrying rates of child marriage and primary school completion among girls, with gender norms around virginity, family honour, and household work hindering progress. Drawing on Rosendorff’s (2005) ‘Three I’s’ framework, the increasing institutional efforts to promote girls’ education and end child marriage are examined, with the conclusion that progress is limited by the failure of the ideas and interests of families, communities, NGOs, and governments to meaningfully address gender norms. The following section, on rural Uganda, documents the complex shifts in gender norms and practices relating to adolescent marriage and pregnancy. The first chapter gives a fascinating analysis of change and continuity in gender norms on sexual maturation and household roles in the Mayuge district. While the importance of girls’ education is increasingly recognised, these norms are both retaining high rates of child marriage, on the one hand, and driving increased instances of informal co-habitation and adolescent pregnancy, on the other. The following chapter calls for complementary initiatives across national policy frameworks, local government, community-based initiatives, and programme interventions. The third section looks at adolescent girls in the ethnic minority Hmong community in Vietnam. The first chapter highlights the critical importance of norms that see restrictive notions of femininity as central to cultural Hmong identity. In spite of impressive progress in children’s access to primary and lower-secondary education, Hmong girls continue to be valued for their productiveness, and experience poor education opportunities, narrow marital options, and high unpaid care and domestic responsibilities. The following chapter provides an intersectional analysis of Vietnamese policy and programming. It argues that in spite of impressive policies on and resourcing for gender equality and ethnic minority poverty, a failure to understand the interlinkages between ethnicity, age, and gender has led to the bypassing of Hmong adolescent girls’ needs. The final section, on Nepal, illustrates the detrimental impact of ‘sticky’ gender norms on child marriage, despite substantial gains in women’s rights. The first chapter looks at Far West Nepal, noting how marriage and honour continue to play a strong role in girls’ worth within the family, with son preference still prevalent. Before marriage, girls are now enjoying improved access to primary education and increased agency in choosing husbands, while after marriage, girls have better education opportunities. Yet barriers to post-primary education remain, and new trends in child marriage are emerging, whereby adolescents are increasingly eloping to marry without parental consent. The final chapter is a comparative analysis of two programme models for shifting gender norms in Eastern Nepal. Throughout the volume, three key themes re-emerge. First is the slow rate of change in gender norms, which, due to the powerful patriarchal structures at their core, hinder progress in spite of advancements in some areas of gender equality. Second is the complexity of shifting social norms, given the interaction between personal attitudes, gender norms at the family, community and institutional levels, and wider structural dynamics. Third is the potential for change that exists, when equally nuanced strategies are employed through an integrated and holistic approach. 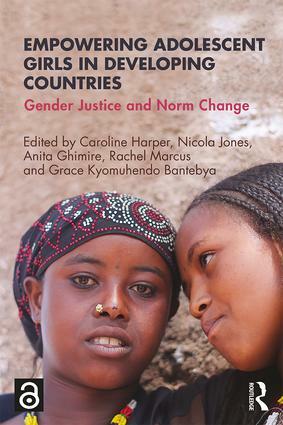 The authors provide some examples of activities and projects executed by adolescent girls to shift discriminatory gender norms, and the significance of girls’ agency is emphasised throughout. However, the importance of development actors supporting and investing in youth-led initiatives is not a strong theme of the overall analysis. Likewise, while some authors address the complexities concerning who decides what constitutes a negative or positive norm, and how to navigate these murky waters, the publication would have benefited from a more thorough exploration of this critical area of social norms studies. That said, highly accessible and lending itself to practical application, this book is an important addition to current discussions on both adolescence and social norm change in gender and development spheres. Policymakers, academics, practitioners, and students in the field of gender and development alike will benefit from its presentation of empirical research, and its analysis of different aspects of policies and programmes across multiple countries and contexts.